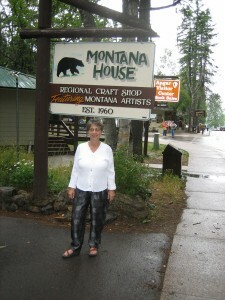 Hans & Toni Jungster established the Montana House Regional Craft Shop in 1960 at Apgar Village, Glacier National Park. The Montana House features arts and crafts made by Native American and Montana artists and authors, include pottery, wood pieces, jewelry, photography, books, quilting, painting, glassworks, Huckleberry products and music by Native American, local and western artists. My parents built the Montana House Regional Craft Shop in Apgar Village in Glacier National Park. In 1959 we moved into the family living quarters in the back of the store. I grew up hiking, camping and exploring Glacier Park with my Dad and Family. Dad was in the 10th Mountain Division in WWII. My family immigrated from Germany to New York prior to WWI and after the war my Dad chose to move to the American West. In the 1960’s the snow banks along the road in Apgar were as high as the school bus windows that picked me up each morning. Each spring while growing up, I tried to set a new record the for earliest day I could swim in Lake McDonald. It was always after July 4th. The lake’s reputation was that it was too cold for swimming because the water came from the Park’s melting glaciers. I first saw Sperry Glacier in 1966. A few years later a friend fell and died in one of Sperry’s crevasses. In one location I could always see the edge of Sperry Glacier from the Going to the Sun Road as I passed Avalanche campground. My friends and I hiked in the summer before the fall rains started in August. That was in the 1970’s. For my 49th birthday in July 2001, my husband Chuck and I hiked to Sperry Glacier so he could see it. We climbed to Comeau Pass near Sperry Glacier, and as far as we could see there was nothing but rocks where I used to see snow in 1970. We could only see snow high up against the mountain peaks. Sperry had already retreated a significant distance from where it was in 1970. I realize that 30 years has passed and the changes I see are not small. The summer of 2007 we walked along Lake McDonald Creek in Apgar Village and saw brown slime on the bank. I was concerned that there was a leaky sewer problem. The Park Service knew of the slime and said to look up “rock snot.” There were 2760 “internet results” on “Didymo – a type of algae that joins together and looks like toilet paper.” It grows in places where the water has warmed up in New Zealand, Canada, and Oregon. According to what I read, fish don’t survive well in it. It now grows along McDonald creek which is in my back yard. The trim is now a goldenrod color, the sign has changed again and the carport has been added. The parking spaces have been replaced by a deck and public seating. After the Apgar fire in 2003, the wood shingles were replaced with a new metal roof. My neighbor works for the USGS and studies the glaciers in Glacier Park. He tells me that there likely could be no glaciers left by 2030. Mountain goats and wolverines will move north across the Canadian border in search of the snowy climate and landscape that they need to survive. He says that the landscape will continue to change. I’ve noticed that the coyotes in Apgar Flats appear to have moved out, and the foxes have moved in. Another friend works for the State of Montana on the situation and problem of coal mines in British Columbia. Coal mining will pollute the water and adversely affect animal habitat and migrations. I’ve heard that China really wants the coal that is there. There is a 1909 Boundary Waters Treaty that says neither country can pollute the waters of the other. Glacier Park is part of the Crown of the Continent, and ecosystem that is still pristine as it can be and very similar to what Lewis and Clark passed through in the 1860’s.It is my hope that each country will honor the 1909 Treaty. Glacier Park is where I have lived long enough to see what is happening as the climate changes. It will always be a special and unique place for me – even as it changes so quickly.